Happy Hannukah, everyone! 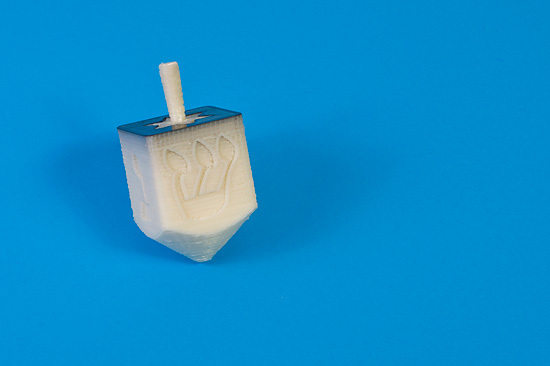 Here’s the dreidel I made. It’s not made out of clay, or even “brey” (which is lead) but it is made out of ABS plastic. You know, the same plastic that LEGOs are made of. You can make your own, just grab the file from Thingiverse and print it on your home 3D printer. Don’t have a 3D printer at home? You could always swing by Milwaukee Makerspace, or maybe the next MKE3DP Meetup. 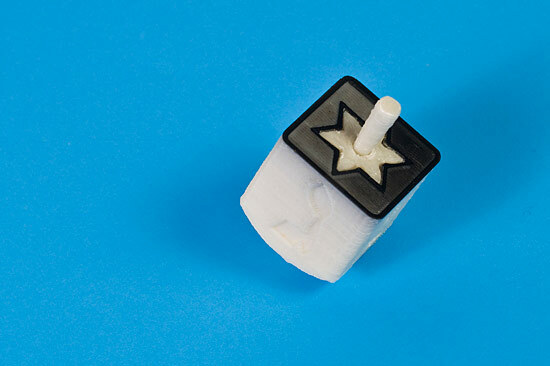 If you’re wondering why the top of the dreidel is a funky black while the rest is white, it’s due to switching filament colors from black to white before printing, but not bothering to clear out all the black. I do this on purpose sometimes, because it causes this interesting effect. Also, if the handle looks weird, it’s because I broke it and then re-attached it with acetone, but did it upside down. It still turned out very nice, in my opinion!